As this diary is written, the rain is battering down on the site hut and some very damp diggers are heading for shelter. It is 3.40pm and, very regretfully, the weather has closed down the site for the day. It may have been a truncated session, but it has been a good one. In Structure Twelve, Owen and his team continued to remove rubble from the robbing event in the eastern wall. While taking stones out, Billy discovered a deeply incised stone. It is, and you can take your pick, either a bow-tie or a butterfly. Either way, you’ll get the idea. 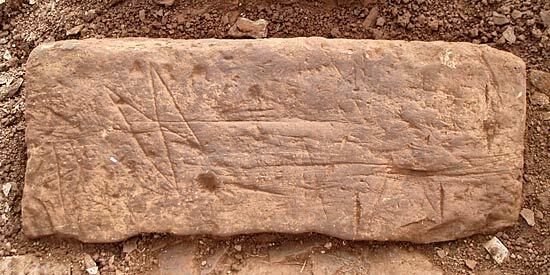 This motif is one of the most common on site, but is, usually, only very lightly incised. 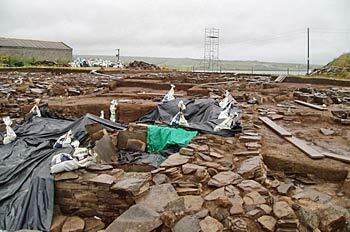 In Structure Eight, more of the roof tiles were removed and work was carried out on defining the hearth nearest the northern entrance. Surprisingly, it has turned out to be a double hearth, larger than the Neolithic normal and presumably made bigger for reasons which have yet to be understood. More light will come when the deposits within, and outside, it are excavated and analysed. In Structure One, further work was carried out on the occupation deposits and on the central hearth, which is not symmetrical to the rest of the structure. It may represent a secondary hearth, which is related to the big, curving wall that intrudes into the original central area of the structure. 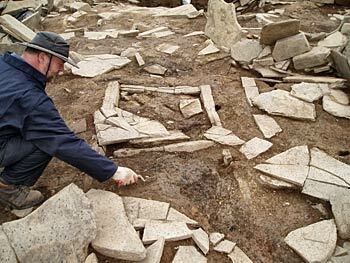 If, however, Structure One has the same internal layout as House Two, at the nearby Barnhouse Settlement, that it so resembles, this hearth may overlie an earlier, more symmetrical, hearth, relating to its original plan. Another hearth is also coming to light close to, and partially overlaid by, the later inserted curving wall. An orthostat related to this later wall (one of three orthostats at right angles to this wall that create a series of recesses) also bisects this hearth, so we expect this hearth at least to relate to the original plan of Structure One. Also in Structure One, Simon was busy defining the original north entrance (one of three in the original plan) when he noticed a very unusual decorated stone on the side of the passageway. It comprises scores of incised, parallel lines – perhaps the sort of thing which might have been produced by a hyperactive bar-code machine! Nothing else like this has so far been noted – an intriguing puzzle that we are sure Antonia will provide an answer for. The team in Structure Ten was joined today by Professor Mark Edmonds, of York University. 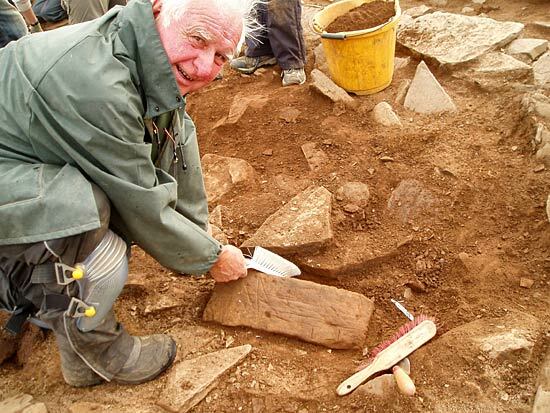 As an expert in lithics (stone) and landscape archaeology, he is clearly in the right place at the Ness and his experience and input is much valued. Dave is working in an area between Structures Eight and Ten, roughly where the passageway surrounds Structure Ten. He expected to find signs of the huge bone deposit which fills the passageway, which is though to be part of a closure event when Structure Ten was decommissioned. Puzzlingly, he found little sign of the bone at all. Further investigation, however, showed that this is a part of the site where stone robbing has taken place, probably in antiquity. The bone has obviously been thrown away by the stone robbers. 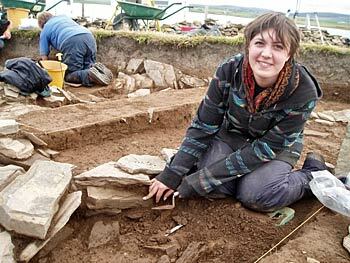 In Hugo’s northern corner, Olivia, who discovered decorated stones on her working visit last year, discovered more this morning. It was in an area of ephemeral, late- phase walling, which has possibly been re-used from some of the earlier structures. The second session of the Excavation Club was also held today – 12 potential young archaeologists joined us from around the globe! 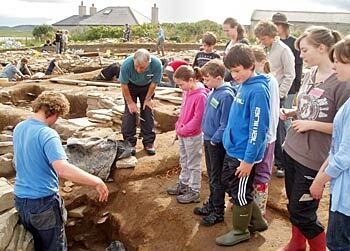 Once again their enthusiasm shone through and, under the watchful eyes of the Historic Scotland Rangers and Helen, they made some exciting discoveries – all going home extremely happy with their experience and many asking to join the dig full time once they are old enough. We are all off home now, to anxiously look out the weather forecast for tomorrow. I am Forrest Jarvi and my involvement, here at the dig, seems a bit more complicated than many of my fellow students and volunteers. I attend Montana State University, studying anthropology, and I was planning on enrolling in a summer field school in eastern Montana, on the Great Plains of the northern United States. The class was cancelled and I found myself searching for a new field school. Now, I’m earning university credit, through Willamette University, in Oregon, while excavating in Orkney and, to be honest, enjoying the excavation itself more than I expected. Even days like today, where I uncover a grand total of two small chunks of plain pottery, are fascinating. I realise that this site is unique, not only in its local context, but also on a global scale, and that makes every day a broadening experience…even if most of my work involves carefully trowelling dirt for the entire day. The people on site also make this dig special. It’s a wonderful mix of professionals, volunteers, and students, who fill the site with chatter and the exclamations that follow particularly startling finds (and there are more of those every day). Put all this in the beautiful surroundings of Mainland Orkney, and you have the makings of a wonderful experience. I’m looking forward to the next few weeks, and I expect to be further intrigued each and every day.